A Windermere bus service that was scrapped by Cumbria County Council has continued to operate, thanks to the dedication of local residents. ‘Friends of the 597’ was set up by a group of volunteers from the South Lakeland town, with the aim of raising funds to maintain the 597 bus service which runs a circular route through Windermere and Bowness. 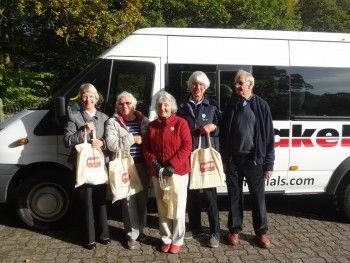 Friends of the 597 received a grant of £1,000 from the Holehird Trust, which has enabled them to sustain the bus service. Many older, vulnerable people, some of whom have mobility and health problems, have been encouraged to use the bus so they feel part of the wider community and can continue being independent. One elderly lady who does not drive, has benefited greatly from the 597 bus service. Until recently, her husband had driven her everywhere, but a major car accident meant he could no longer drive and she was stuck for transport in to the town. The 597 bus currently runs three mornings a week. However, Dorothy hopes that in the future, the bus service can be accessed throughout the week.